This year MSPO 2014 was also an opportunity for small arms manufacturers to confirm the exceptional quality of their products. That's why Fabrika Broni "Lucznik" Radom has chosen MSPO to officialy showcase its two last small weapons : the MSBS assault rifle conventional variant prototype and the PR-15 Ragun pistol. The MSBS-5.56 is a modular assault rifle system currently under development by Fabrika Broni. It is fully designed and manufactured in Poland. The modular fire-arms system with quick-change barrel is based on a common upper receiver for a conventional or bullpup design. Thank's to variety of modules, the conventional and bullpup design variants can be easily transformed into assault rifle, carbine, designated marksman rifle or light support weapon. The modular design also allows for adding configurations in the future. Both variants are chambered in 5.56 mm but a 7.62 mm version will probably be considered. Magazine capacity is available in 30 or 60 rounds versions. According to local media, French Defense Procurement Agency (DGA - Direction Générale de l'Armement), which wants find a successor to the FAMAS, will perform a complete range of tests on three to five MSBS prototypes in a near future. 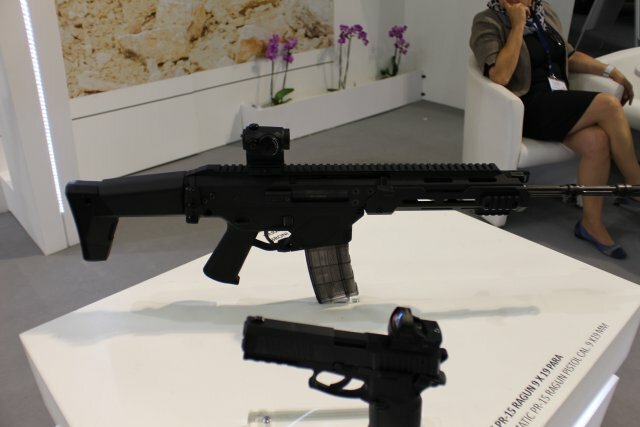 Moreover, FB Radom also underscored its PR-15 Ragun semi-automatic rifle. 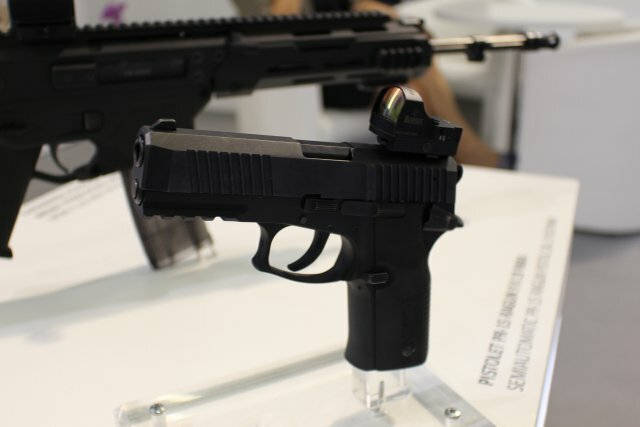 The Ragun has been developed to Polish Armed Forces requirements and is designed with an aluminium frame, short recoil operation, external hammer, and double-action trigger mechanism. The PR-15 pistol is chambered in the 9x19 mm NATO cartridge and is intended to replace the Polish military's existing sidearms, such as the P-64 'CZAK' and P-83 'Wanad', which are all chambered in the Russian 9x18 mm Makarov cartridge. The box magazine contains 15 rounds; optional 20 and 10-round magazines are available.